So I was just minding my business trying to purchase a video on demand from Amazon.com, the website that sells everything. After complaining about the inability to rent the movie using my iPod touch (it requires Flash to order), twitter friend @meredithmo (http://twitter.com/meredithmo) linked me to a post on Jezebel.com about how Amazon was de-ranking a lot of homosexuality-themed literature. 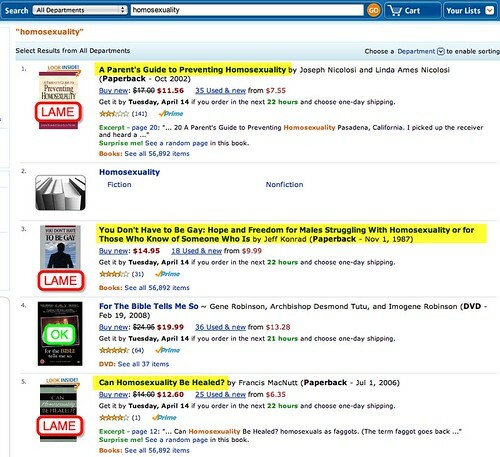 The image above shows the top five search results for "homosexuality" now on Amazon.com after this company's little hate-based stunt. Meanwhile, I'll watch something on Netflix and will be withholding money from Amazon until its leaders decide to stop this campaign of ignorance. I just wanted to watch a movie, yall.